Liquid-infused surfaces have attracted great interest in recent years due to their super slippery properties upon drop impact and potential benefits in self-cleaning and anti-fouling applications without much understanding of the underlying physics. This project seeks to examine the drop impact dynamics on lubricated and liquid-infused surfaces, with a focus on probing the role of the entrained air layer prior to drop-film contact and during drop-film interactions. Understanding the air film dynamics underneath the droplet allows for the better tuning of the liquid film properties in the lubricating layer, designing more robust nanostructures, and ultimately enhancing the performance of liquid-infused surfaces for applications ranging from anti-fouling and anti-icing to phase separation and thermal management. Thermal management systems for electric power plants account for approximately 40% of total fresh water withdrawals in the US. Due to dwindling access to fresh water resources worldwide, continued operation of these systems poses a significant engineering challenge. As such, this project aims to develop transformative "dry-cooling" technologies completely eliminating the use of water for cooling steam condensers in modern electric power plants. This will be achieved using phase-change materials (PCM) to decouple the condensation and heat rejection processes, reducing steam condensation temperature, pressure drop, and system size as compared to current air-cooled condensers (ACCs). 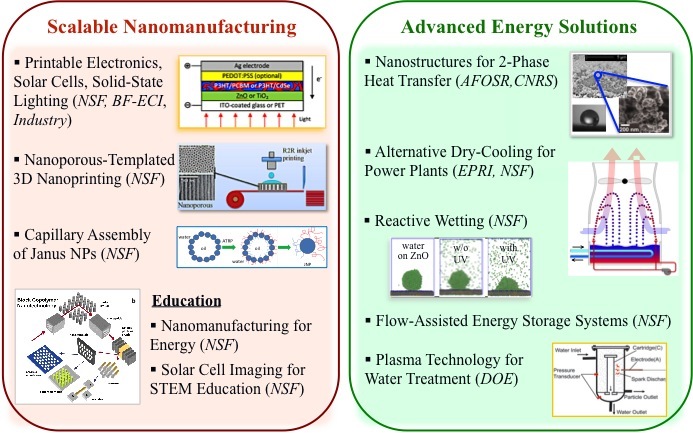 This project conducts fundamental research on integrating inkjet printing of functional materials with nanoporous structures for high-throughput manufacturing of 3D heterogeneous nanostructures for energy, biomedical, and sensing applications. Specifically, the research will combine in-situ imaging, multi-scale modeling, and advanced characterization to examine the simultaneous wetting, infiltration, and evaporation of inkjet-printed functional inks onto nanoporous substrates and the subsequent particle self-assembly and deposition processes both inside and through nanopores. 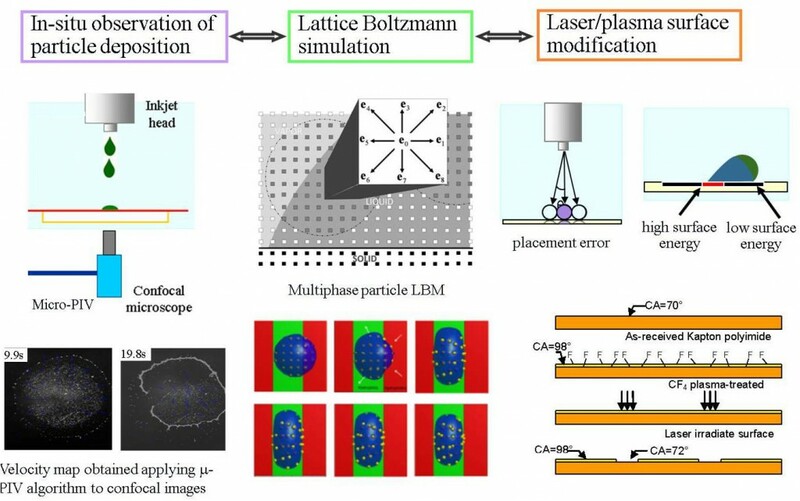 A synchronized high-speed camera, confocal microscope, and laser interferometry setup will directly observe the complex transport phenomena during the 3D nanoprinting process. A multi-scale approach, integrating a mesoscale lattice Boltzmann model at the entire drop level and a molecular dynamics model for probing interactions of nanoparticles with the contact line inside a single pore, will be developed to capture the radial-dependent infiltration process in nanopores. The project goal is to build the structure-process-property relationship for nanoporous-templated 3D nanoprinting. Li-air battery, with its usable energy density close to 1,700Wh/kg, has captured worldwide attention as a promising battery solution for electric vehicles. However, current Li-air technology suffers from low round-trip efficiency and rate capacity. The cathode microstructure and the Li2O2 formation can have a significant influence on the performance of the non-aqueous Li-air battery. Our objective is to examine the effect of electrode microstructure and Li2O2 growth morphology on Li-air cell performance via combined multi-scale modeling and experiments. Most efforts attempt to design electrode microstructures for enhanced round-trip efficiency through costly and time-consuming experiments and highly empirical knowledge. Our integrated program includes novel electrode fabrication, high fidelity multi-scale modeling, post-mortem and in-situ characterization, electrochemical testing, and high performance computing to probe the effects of electrode microstructure and Li2O2 growth morphology on cell performance. This career plan will advance the fundamental understanding of transport processes of inkjet-printed functional materials on flexible substrates through the integration of innovative research and education. The proposed research combines novel modeling and experiments that include: (i) in-situ observation and multi-scale modeling of the flow, heat and mass transfer induced by the interplay of wetting, evaporation, and self-assembly of inkjet-deposited materials; (ii) laser and plasma substrate surface modification for improved deposition in a roll-to-roll (R2R) format; and (iii) microstructural and electrical-thermalmechanical property characterization of deposited material. The focus is on the mesoscopic scale, where Marangoni flow, evaporation, and particle self-assembly can be directly observed. 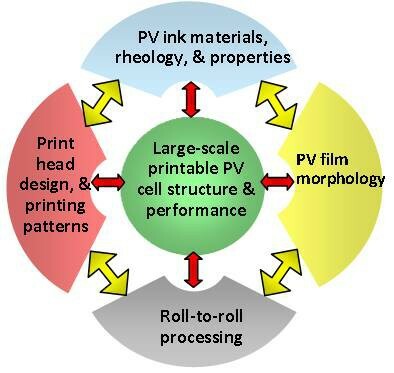 This multi-institutional collaboration seeks to advance PV ink formulations and to optimize inkjet printing processes and printing devices for large-scale fabrication of hybrid solar cels with improved device efficiency and throughput. 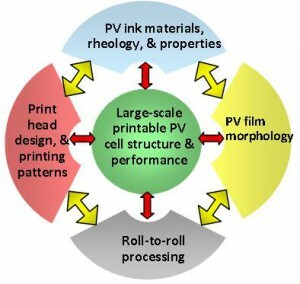 The major tasks are to: (i) develop hybrid photoactive ink formulations compatible with large-scale printing processes; (ii) optimize the print head design, jetting parameters, printing patterns, and process parameters for improved deposition morphology and properties; (iii) characterize properties of inkjet-deposited device layers and solar cell performance; and (iv) demonstrate the scalability of the inkjet-printing process for large-area roll-to-roll fabrication. This project seeks to obtain fundamental knowledge on the exact coupling between the hydrodynamic conditions and the colloidal aggregation rate, as well as the colloid size effect on different interaction forces through the combined use of laser scanning confocal microscopy, microscopic particle-image velocimetry, and dynamic light scattering techniques. The lattice-Boltzmann method for direct numerical simulation of colloid-fluid interactions will be introduced to complement experimental measurements. The outcome of the proposed work will provide design protocols for tuning nano-sized colloids toward desired properties and structures. Fundamental understanding of how heterogeneous nanostructures, stimuli-responsive surfaces, and the combination of both affect bubble nucleation, growth dynamics, fluid-substrate interfacial thermal resistance, and bubble departure diameter is crucial in improving the limit of critical heat flux and heat transfer coefficient in two-phase heat transfer. The objective of this project is to obtain atomistic level understanding of liquid-vapor phase transition, fluid-substrate or fluid-particle interactions, and triple junction dynamics during droplet/film evaporation/boiling on stimuli-responsive, nanopatterned surfaces. Fundamental understanding of coupled reaction and wetting dynamics during reactive wetting is crucial in creating stronger bonds in materials joining, better adhesion for thin film coating, novel composites for bio-implants, and new routes for surface modification with tunable functionalities. This award supports theoretical and computational research and educational activities related to coupled reaction and wetting dynamics in droplet spreading. Special attention is paid to examine the effect of intermetallic compound formation on drop wetting kinetics, contact line advancement, and the evolution of the solid-liquid interface. Using a multi-scale model that integrates the hybrid phase-field and arbitrary Lagrangian-Eulerian approach at the macroscopic scale and molecular dynamics simulations at the atomistic level, this project seeks to answer: (i) What are the dominating driving forces and dissipation mechanisms in reactive wetting? (ii) How is material delivered to the contact line during new interface formation? (iii) How does the S/L interface evolve during coupled reaction and wetting? The vanadium redox flow battery (VRFB) is a viable grid-scale storage technology that offers cost-effective energy storage solutions for renewable energy applications. At present, identification of proper electrode architectures for VRFBs is very challenging due to the lack of understanding of how the internal structure of these materials affects the physical and chemical phenomena. In this study, we seek to quantify the structure-transport-performance relationship of the electrodes to assess the connection between the electrode structure, electrolyte flow and overall system performance through a 3-D pore-scale model. The phase-field method has been developed as a powerful tool for inexplicit tracking of the interface for complex phase transformations and multiphase flow problems involving curvature effects. We have developed novel phase-field models for two-phase flows with surface tension, phase-change, and large property differences between the phases. The model has been applied to simulate the Rayleigh-Taylor instability inside a Hele-Shaw cell and bubble growth and flow in supersaturated liquid, both with interface topology changes. We have also developed phase-field models for microporosity formation in alloy solidification where nucleation, interfaces, and growth morphologies, micro-flows are directly simulated. One of the primary issues with flip chip technologies is void formation inside the small gap between the chip and printed circuit board. This multiply-connected region typically contains thousands of bump interconnects. Underfill flow through the gap is driven by capillarity where voids have detrimental effects on the reliability of flip chip packages. In this project, we conduct both experiments and simulations to examin the edge effect, filler particle volume fraction inhomogeneity, temperature-dependent underfill properties, and effect of flux residue on underfill flow for various bump patterns. Our goal is to provide guidelines for the bump pattern design, underfill dispensing process, and underfill/flux material selections for a variety of applications. One of the critical issues in next generation thermal management of microelectronic systems is to develop a standardized method for in-situ thermal measurement of thermal interface materials. In this project, we utilize and upgrade existing transient thermal measurement tools, including a flash diffusivity tester and an infrared camera, for characterizing thermal interface materials and other multiplayer, heterogeneous thin samples. We also explore a new high resolution, transient infrared microscope and extend our modeling capability in heat transfer at material interfaces. © Copyright 2019 All rights reserved MEM Ying Sun Lab.